Planar subdivision is the subdivision of a plane into a set of non-overlapped regions (facets) that cover the whole plane. The above structure describes a subdivision built on a 2D point set, where the points are linked together and form a planar graph, which, together with a few edges connecting the exterior subdivision points (namely, convex hull points) with infinity, subdivides a plane into facets by its edges. For every subdivision, there is a dual subdivision in which facets and points (subdivision vertices) swap their roles. This means that a facet is treated as a vertex (called a virtual point below) of the dual subdivision and the original subdivision vertices become facets. In the figure below, the original subdivision is marked with solid lines and dual subdivision - with dotted lines. OpenCV subdivides a plane into triangles using the Delaunay’s algorithm. Subdivision is built iteratively starting from a dummy triangle that includes all the subdivision points for sure. In this case, the dual subdivision is a Voronoi diagram of the input 2D point set. The subdivisions can be used for the 3D piece-wise transformation of a plane, morphing, fast location of points on the plane, building special graphs (such as NNG,RNG), and so forth. Quad-edge of a planar subdivision. Point of an original or dual subdivision. This integer can be used to index auxiliary data associated with each vertex of the planar subdivision. Calculates the coordinates of the Voronoi diagram cells. subdiv – Delaunay subdivision, in which all the points are already added. The function calculates the coordinates of virtual points. 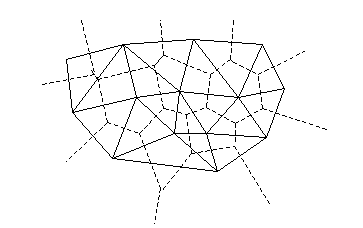 All virtual points corresponding to a vertex of the original subdivision form (when connected together) a boundary of the Voronoi cell at that point. The function removes all of the virtual points. It is called internally in CalcSubdivVoronoi2D() if the subdivision was modified after the previous call to the function. Creates an empty Delaunay triangulation. rect – Rectangle that includes all of the 2D points that are to be added to the subdivision. storage – Container for the subdivision. The function creates an empty Delaunay subdivision where 2D points can be added using the function SubdivDelaunay2DInsert() . All of the points to be added must be within the specified rectangle, otherwise a runtime error is raised. Note that the triangulation is a single large triangle that covers the given rectangle. Hence the three vertices of this triangle are outside the rectangle rect . Finds the subdivision vertex closest to the given point. subdiv – Delaunay or another subdivision. The function is another function that locates the input point within the subdivision. It finds the subdivision vertex that is the closest to the input point. It is not necessarily one of vertices of the facet containing the input point, though the facet (located using Subdiv2DLocate() ) is used as a starting point. The function returns a pointer to the found subdivision vertex. edge – Subdivision edge (not a quad-edge). The function returns the edge destination. The returned pointer may be NULL if the edge is from a dual subdivision and the virtual point coordinates are not calculated yet. The virtual points can be calculated using the function CalcSubdivVoronoi2D(). Returns one of the edges related to the given edge. The function returns one of the edges related to the input edge. Returns next edge around the edge origin. The function returns the next edge around the edge origin: eOnext on the picture above if e is the input edge). Returns the location of a point within a Delaunay triangulation. pt – Point to locate. 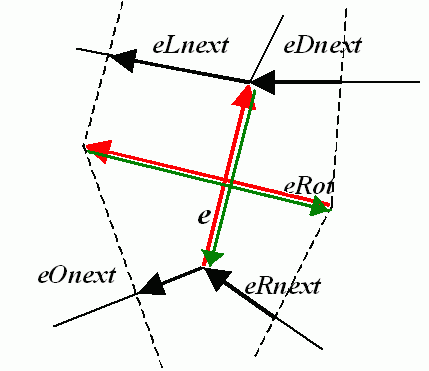 edge – Output edge that the point belongs to or is located to the right of it. vertex – Optional output vertex double pointer the input point coincides with. The point falls into some facet. The function returns CV_PTLOC_INSIDE and *edge will contain one of edges of the facet. The point falls onto the edge. The function returns CV_PTLOC_ON_EDGE and *edge will contain this edge. The point coincides with one of the subdivision vertices. The function returns CV_PTLOC_VERTEX and *vertex will contain a pointer to the vertex. The point is outside the subdivision reference rectangle. The function returns CV_PTLOC_OUTSIDE_RECT and no pointers are filled. One of input arguments is invalid. A runtime error is raised or, if silent or “parent” error processing mode is selected, CV_PTLOC_ERROR is returnd. Returns another edge of the same quad-edge. The function returns one of the edges of the same quad-edge as the input edge. Inserts a single point into a Delaunay triangulation. subdiv – Delaunay subdivision created by the function CreateSubdivDelaunay2D(). The function inserts a single point into a subdivision and modifies the subdivision topology appropriately. If a point with the same coordinates exists already, no new point is added. The function returns a pointer to the allocated point. No virtual point coordinates are calculated at this stage. © Copyright 2011-2012, opencv dev team. Last updated on Nov 03, 2012. Created using Sphinx 1.0.7.